Here’s a photo of yours truly speaking in New York City on October 21 at the DailyDOOH’s “Billboards Unplugged” conference, part of its ongoing Thought Leadership Summit series. More details here. It was an excellent, tightly focused event. New contacts were made and old contacts were renewed –all in all, I’m very glad I participated. My topic was (surprise) interactive gigapixel displays and how they were going to fundamentally change how billboards were going to be created, deployed, and used. 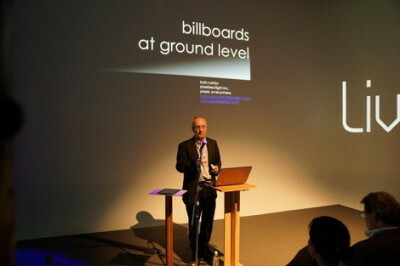 The next event in the Thought Leadership Summit series (“Video Walls Unplugged”) will be at Digital Signage Expo in Las Vegas in February 2014. Our friends at the DailyDOOH will soon be hosting their second Thought Leadership Summit. The first one was in London this past May and the second one is next month in New York City. The theme this time will be “Billboards Unplugged”. I’ve been asked to participate again, so I’m busy preparing. I decided I’d consider how one of my favorite topics –gigapixels– is going to affect the future of billboards. Affordable, practical-sized, gigapixel displays will mean large area billboards will be able to be installed just about anywhere. When I mean anywhere, that includes billboards at arm’s length from viewers. That will be a game-changer. I’ve titled my talk “Billboards at Ground Level”. Say goodbye to boring megapixel electronic billboards. Get ready for gigapixel ones. 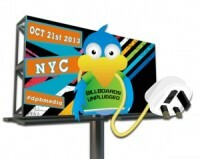 Are you going to be in New York on October 21st? You really ought to attend this event. Hope to meet you there. We’ll know Digital Light has arrived when…. …when we simply call it ‘light’. Mobile phones are now simply phones. HDTV is now simply TV. Digital cameras are now simply cameras. Digital Light will one day simply be called light. Sooner than we think. How else will we know?